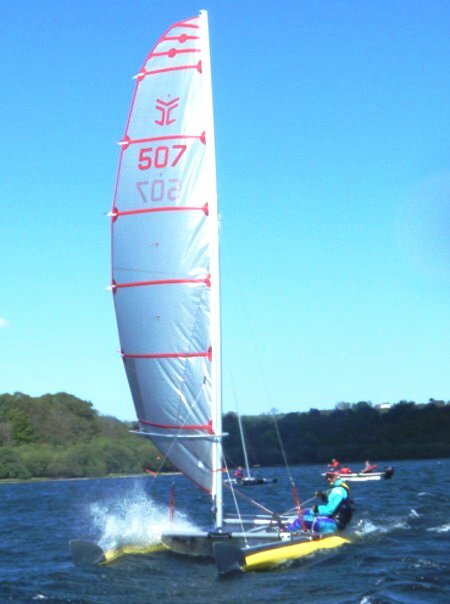 This is about running before the wind, the breeze "pushing" on the sail (let as far out as it will go) rather than flowing across it. 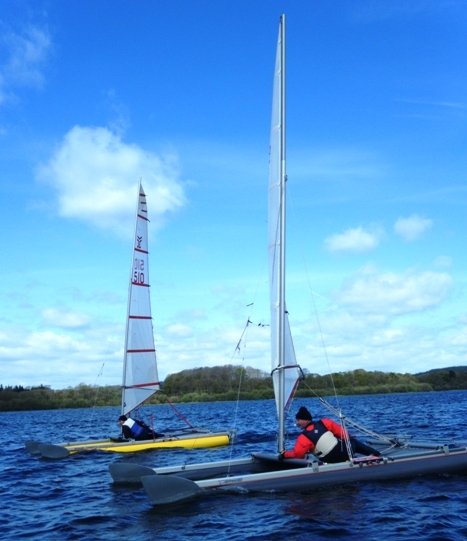 (Photo right) At Bassenthwaite in 2010, Nigel and George are getting their weight well forward in light breeze and staying still---you can feel them urging the boats forward, telling the wind to push harder. In heavier wind, weight adjustment on the run needs to be more active and alert. At Bass (a year later) in the strong gusting breeze (below left) Paul is watching the bows dip as he rides a gust, with no option but to hang on as far back in the boat as possible (as the sail cannot be slackened off further) He aims to keep speed up, since running directly downwind eases the wind pressure. 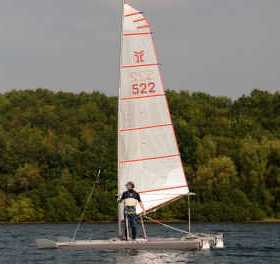 All the adjustments depend on conditions and the course---in stronger wind, it may be difficult to carry out any which require moving from the back of the boat, and in a lake course with a short run, adjustments may not be worth the time taken to trim, and then readjust before the next mark. -- Flipping the wishboom If the wishboom is tipped from lying flat to roughly vertical, the sail can be let out further, exposing slightly more area. None of the boats here show this! (Nigel's in the top photo is slightly tilted.) 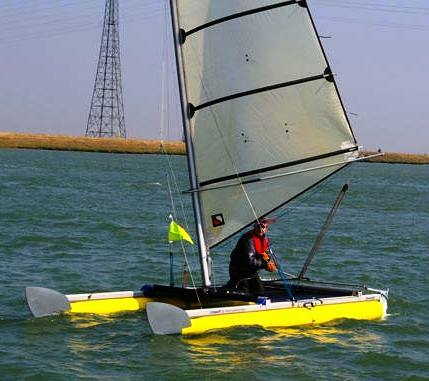 This is a medium-breeze option---in light winds, the sail pressure will not hold it in place, and in heavy conditions it is not worth the risk going forward to lift the boom. --- Raising the centreboards (now "outlawed" by the Association racing riules!) Good in theory, but opinion varies on whether it is worth it in practice. Heavy conditions prevent doing it quickly and easily. In moderate breeze, the downside is replacing them, moving awkwardly in the boat as the buoy (and other boats) get closer. There is also the risk (if not dead before the wind) that board will be caught by the leeway and twist as it goes in, breaking off a chunk of the trailing edge. This can be guarded against by putting it down tilted back so the leading edge of the board runs firmly down the front channel, at the cost of marking the paint. A long run in lighter conditions is the clear place for this. 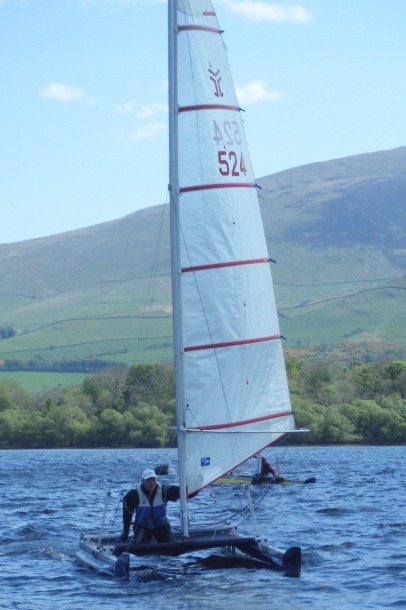 Finally, whatever you do on the run, you may still not find the extra yards over the opposition, below at Bala.